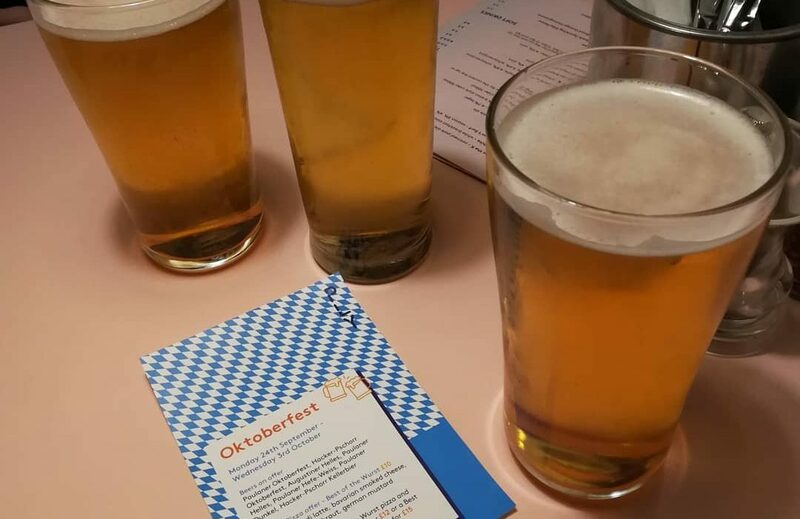 PLY; a bar and pizza parlour nestled in the heart of the buzzing Northern Quarter, recently played host to a 10-day-long celebration of all things Oktoberfest. The event ran alongside the restaurant’s usual offering of a mouth-watering sourdough pizza menu and extensive range of drinks. Boasting the exclusive availability of many traditional German brews rarely accessible outside of Oktoberfest and Munich. Excited to check out the event and eager to take advantage of the offers available, I visited the restaurant on a bustling Friday evening. I made the mistake of forgetting to make a reservation, but after a short wait I was quickly seated. Captivated by the Oktoberfest deal (who doesn’t love a bargain? ), the offer of the themed pizza and two steins for £15 was jumped upon by both me and my friend. The staff who served us were thankfully knowledgeable on their beer (unlike us) and able to recommend the Paulaner Oktoberfest and Augustiner Helles beers to accompany our ‘Best of the Wurst’ pizzas. Although the traditional German stein glasses we expected to see at such an event were absent, we both thoroughly enjoyed our beverages. On request, the staff willingly accommodated to my friend’s dietary requirements, allowing them to sample a vegan version of the Oktoberfest pizza almost identical in appearance to the meat version, featuring vegan cheese and chorizo instead of bratwurst and Bavarian smoked cheese. The service was impeccable with our food arriving in what seemed like seconds after placing our order, pleasantly surprising due to the obvious busyness of the bar. The converted space gives a modern, industrial feel to the bar accommodating to social occasions and large groups, but also providing a feeling of intimacy through the low lighting and inclusion of comfy sofas and smaller tables positioned to the side of the main area. At times I did feel the music was too loud, but perhaps this is to be expected of a bar on a Friday night. Nevertheless, it didn’t take away from the general experience, and encouraged us to continue our night by venturing to further bars. The Oktoberfest event has sadly now ended. PLY is still a great place to check out if you are looking to satisfy that pizza craving without being left deep in your overdraft or seeking somewhere with the lively atmosphere required to get a night out in NQ started.